Our Raison D'Etre, with a little extra. This immodest brew, made with an obscene amount of malt, brown sugar & raisins, takes Belgian-style browns to new heights. Big thanks to jhughes23 for hooking me up with this bottle. 2007 vintage. Enjoyed on 07/22/11. A - A slight hiss comes from the bottle upon popping. A very aggressive pour into a goblet yields a small head which was surprising. This recedes quickly and a small ring of bubble remain around the edge. It's a just slightly cloudy deep red/purple color. Great legs. After 4.5 years, the fact that I was able to generate any head out of this is amazing. S - This is my third of the ultra-high-grav DFH series after I loved WWS and 120. When you first smell all of them, your first thought is nail polish remover because of the huge alcohol content. But after a few minutes, you become accustomed to this and can pick up all their subtle nuances. As expected, this one is fruity and incredibly sweet. Raisins (obviously), plums, grapes, apples, cinnamon, maple syrup. Great stuff. T - Very sweet and fruity like the aroma. Big raisin and grape notes. Also the cinnamon and even some oaky vanilla comes in. Plums, cherries, and of course, some alcohol are also present. This is very rich and complex. M - The mouthfeel is just where it needs to be for this beer. Huge, thick and with minimal carbonation. This is obviously a sipper because of the alcohol but also because it's so complex. O - Overall, another great one from DFH. A seriously innovative and unique beer. Please make this again, Sam! One of the best made big beers I've ever had. Sampled at DFH Alehouse in Gaithersburg MD on tap. Very sweet and smooth and rich. Minimal boosiness and no burn for an 18% brew. This beer hovers somwehere in a hybrid state between an English Barleywine and Big Belgian Quad/Strong Dark Ale. Lots of dark fruit flavor (raisin/fig etc). Classification is irrelevant. This may be the best DFH beer ever made. 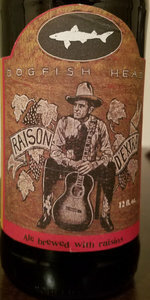 The return of Raison D'Extra! I remember loving this beer years ago, and being so disappointed that it was being 'retired' (apparently only for an 8 year hiatus), while the much inferior Raison D'Être lived on. Very excited to see it return. This 12 oz bottle has no ABV labeling. It pours deep ruby, on the brown side of red, with a thin tan head, and crystal clear. Very striking looking in this Chimay chalice. Aroma is rich and fruity: raisins of course, and plums. But even served cold there is a little bit of ethanol in the nose. The flavors of this beer are immediate, rich, fruity, and pleasant. Slightly tart raisins, treacly malts. But the initial flavors fade, leaving a thin middle, and finish with a serious dose of alcohol. It doesn't taste 18%, but I'd guess at least 12%. Belgian strong dark ale doesn't describe this accurately. This is barleywine in a more literal than average sense. Sam from DFH described it as intending to bring some qualities from red wine over to beer. I think it succeeds. In this young, uncellared form I find it not to be particularly complex. The result is merely great, not outstanding. I must buy more to cellar for a couple years while this is still available. Surprised by the head I was able to generate on such a huge beer. The head is khaki and sticks around well. Body is a deep ruby. Aroma is hugely sweet and raisiny with a tinge of alcohol. Plum, cinnamon, cherry, and a little spice. Taste is sweet and fruity with raisin and plums. Alcohol hits heavier on the palate. Ends with some spice. Slightly syrupy with a mild level of carbonation but enough to move the beer along and not feel super heavy. Surprisingly drinkable for the ABV. 12oz bottled 11/21/14 (4 years ago today) poured into a DFH branded teku glass at fridge temp, no ABV listed on label. The beer pours slightly murky medium brown in color with light khaki colored head. The head recedes to a pencil thin ring. No lacing. The aroma is raisin, rich malt, brown sugar and sweet booze. The flavor is sweet rum soaked raisins, burnt sugar caramel with a barely tart berry-like medium bitterness to finish. The mouthfeel is medium bodied with above average carbonation and a semi dry finish. Sweet, but not cloying. The carbonation or the alcohol tingles the tongue for a minute after each drink. The alcohol is evident in the aroma and taste at any temperature, but isn't overpowering. Overall, excellent just based on the sheer audacity of the product. I can't speak for fresh or aged 10 years, but I wish I could. This beer was aged in a 55 degree refrigerator from time of purchase (close to bottling) and is really not showing any sign of going downhill. Had this one on tap at the Dogfish head in Gaithersburg. Blown away. I am a fan of the Strong Dark Belgian to begin with so there was a good chance I would like it. Blew me away, outstanding taste and drinkability and it just did not come across as strong as it is listed. I hope to have this beer again many times, the top 1% of beer. LOOK: Gorgeous ruby red with pretty good clarity. Head recedes to a ring. No sediment, small ring of head lasting through. SMELL: Deeply aromatic malt, brown sugar, Belgian yeast, loads of caramel. Even some cocoa and raisin going against a wall of caramel sugars. Alcohol and yeast stank make me just intoxicated by aroma alone. TASTE: Big dry malt, full malt flavor actually, brown sugar and caramel, some hops are kicking around also. Faint cedar, almost like this beer was "randalled" through a cigar box in a small portion. Toffee, cacao, minty hops, black forest cherry, and caramel creme. Alcohol is there but not as intense as would be expected from roughly 18% abv. FEEL: Just sits there on the palate permeating and then after the swallow, just disappears off the tongue. Full bodied, smooth for the strength, but definitely a bruiser. OVERALL: A very tasty, extra special beer from Dogfish Head, and a "Classic Extreme Beer". Very enjoyablle. An expensive, rich, and complex brew. At an 18% ABV and a $10.00 a bottle price, you'll want to savor every sip. Enjoyed from the 12 oz. bottle, it is best just slightly warmer than refrigerator temperature to get full benefit. Obviously extraordinary, well worth the investment. It's strong, but it doesn't taste anything near 18%. Picked up a single at the Craft Beer Hop Stop after work yesterday for $9.99. Bottled on 11-21-14. This is the first of a two-part review. I plan on trying my 2007 version on Sunday. The overall rating is an average of the two vintages. Sunday 1-11-15 review of the 2007 version. Purchased from the now closed Sportsman's Fine Wines back on Halloween 2007 for $8.99. Bottled on 3-15-2007. Overall I am very impressed with this older brew. It did spend some time at 55 degrees and did spend time in my regular beer fridge in the door panel which is probably in the low 40's. I would recommend buying 2 of these and approach the try one now and one the next time DFH releases this brew - it was definitely a fun approach! Been holding on to a single old bottle from 2007 and meaning to drink it ever since the new batch came out in 2014. So, here are notes from the side by side comparison of a 3/15/07 bottle verse the 2014. The old one is hazy brown in color with no head formarion. The freshy is a polished clear amber color with a khaki head that appears and fades quick to a thin film. The nose on the old one basically smells sugary with booze and a touch of minerals. The new one smells of brown sugar and cider. The taste is quite alcohol centric on both. Surprisingly, 9 years in the bottle did little to temper how hot tasting the old bottle was. Plenty of fusel alcohol, brown sugar and slight herbal bitterness. The fresher bottle maintains that brown sugary quality but with a strong focus on cider that I really didnt care for. Both of these brews are full bodied and boozy. Ive been waiting years to drink this and I honestly feel that if you have old bottles, they are still good to hold on to as far as not being oxidized. However, the flavor profile on both the old and new left a lot to be desired. A bit of a let down in my opinion, I dont feel like I need to drink this ever again. Appearance: pours a reddish brown color. a finger or so of a tannish head with good retention and a semi-strong lacing left behind. serious alcohol legs as it swirls around. nearly opaque but shows some signs of clarity and brightness. Smell: raisins, plums, brown sugar and pure ethanol. some hints at belgian aspects but not too much. Taste: opens with raisins and other dark fruits such as plums, dates and prunes. a strong brown sugar sweetness comes through along with some belgian like dark candi sugar. the back has a burning, intense alcohol. Mouthfeel: not overly heavy or thick but certainly there. sweet and with huge amounts of alcohol burn and warmth. lingering burning. Overall: of the big dogfish head beers this is easily the hottest on the alcohol. serious burning. this one has ageable written all over it. with great flavors but so unrounded. can be tasty at times and deadly at others. Fantastic strong ale, wish it was available more often. The heavy malt bill imparts a lot of character on this one. A nose that reminds me of some sort of unbelievably fruity syrup. Figs, plums and raison with notes of grape and the faintest hint of something tropical. Thankfully, all of this is balanced very well for such a powerful beer. Seek this out, if only to try once with friends. Pours a deep slightly cloudy brown with a reddish tint to it. The Head was white but gone in a flash. All that remains is a thin ring which leaves small soapy lacing. The aroma is big and rich, malty with deep fruit and brown sugar. The taste is equally robust and actually more-so. A little bit of alcohol adds to its appeal, which is impressive since its 18% ABV. You won't taste it but you will feel it. The body is thick on the palate and smooth throughout. This one probably would be good to age (as recommended) but isn't cheap for a 12oz. bottle. L: deep mahogany brown, light carbonation, skimming off white head. N: syrupy dark fruits – raisin, prune, plum, caramelized brown sugars, marshmallow, faint caramel/toffee, almost medicinal like floral note finishes it up -surprisingly pleasant. B: incredibly warm, boozy, low carbonation, thick/syrupy mouthfeel. Overall: This is such an intense beer, crazy warm/burning, tons of dark fruits, but a bit too syrupy/medicinal for me. It's an experience to say the least, and I enjoyed it better than 120 Minute. I appreciate the boundaries DFH push, but this isn't something I'd have to consume again. Well worth the try though. Fantastic brew. Definitely worth the $10. Saved my 12 oz. bottle for my birthday. Poured into a white wine glass. It's a cloudy light brown with a thin, foamy white head. First thing that hits your nose is, of course, the alcohol. That's what I expected, at 20%. Then a big, bready, yeasty, malty swell of aroma. Hints of caramel and honey, too. Big malty body to this: bread, caramel, honey. Touch of bitterness on the back of the tongue, so the flavors travel nicely. With a warming alcohol finish. Alcohol is a little bit dominant, but not too overpowering. Mouthfeel is chewy and full. Perfect for the big, sweet flavors. This is a malthead's dream, which means I love this beer. Not an everyday beer, and one you need to sip slowly. But it's a fun experience nonetheless. Try one on your next birthday! 2013 vintage bottle poured into a Spaten cylinder. A - Aged mahogany color, mocha cap is supported by active carbonation. S - Dark fruit, raisin, caramel, burnt sugar, toffee, remarkable depth. T - Fig, dark sugar, dark roasted malts, and a touch of autumn.Alcohol is hidden well. M - Fabulously rich, slick and complete in body. Carbonation cleans things up. O - A decadent treat, to had. A rich desert with some punch. Got this little blessing as an extra in a trade. Thanks to cartoonshop!! Poured a beautiful, rich burnt molasses color, but what hint at a head started quickly dissipated. Aroma: Wow, molasses, raisin a hint of...maybe caramel. Nice! At this point the wife sniffed, and sampled, while I got on BA to check the ABV--wasn't on the bottle. How can that be? Anyway, she told me that it wasn't harsh, but she thought it might be on the higher side. Then I found out it comes in at 18%. Taste: Wow! Smooth, raisin comes through after the initial molasses front. A bit of prune. Finishes smooth, sweet and no burn. However, every once in a while you get a hint of warming, but just a reminder to respect this concoction. Quite nice. What a great surprise as an extra. Thanks Andrew. Appearance: 120z bottle that was bottled on 3/15/07. Pours a cherry color into a tulip with a reddish head that starts to die down instantly. The beer keeps bubbling due to the etched D in the Duvel tulip. Smell: Alcohol, and dried fruit. A very potent and aromatic scent. The smell reminds me exactly of some Belgian beers I have tasted. Taste: Fruit, spice, sweet malt and heat from the alcohol. The fruits I picked up were prunes, raisins, plums and apples. The tastes is exactly what is expected after smelling the beer. Mouthfeel: Syrupy and warming as swallowed. I would never have guessed this beer was 20% ABV from the mouthfeel. There is no burning like I thought there would be from the high alcohol content, I was pleasantly surprised. Drinkability: Much easier to sip and enjoy than I thought it would be. Very well balanced for a beer with such a high ABV. This is a beer I was excited to try because I do not try many beer of this style, I was not disappointed. This is a strong beer and you will feel the alcohol in your system. Definitely a beer I would break out for special occasions especially to share with another person who would appreciate the complexity of the beer.